Breakout boards are great, and while there are many ones available on the market, I mostly use the ones from Adafruit. 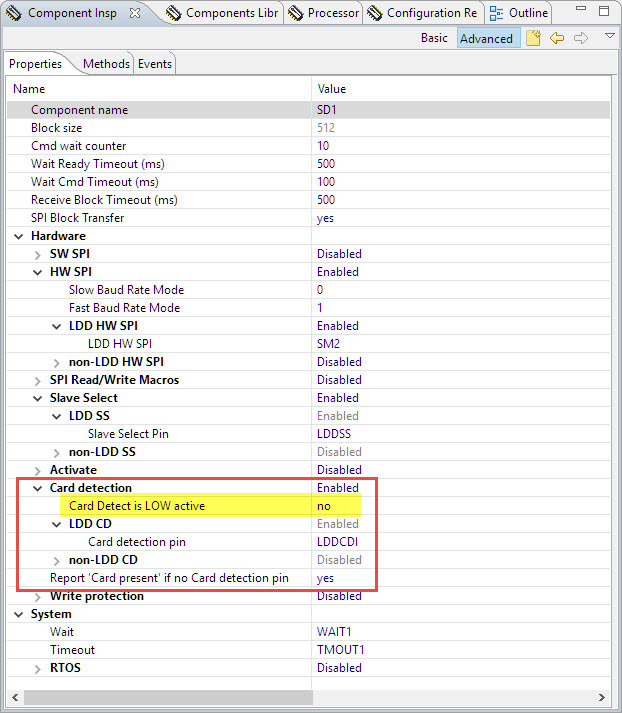 But if you are using a different SD or microSD card board, the project used in this article easily can be adopted to a different card. I hope this is useful for you too. This entry was posted in ARM, Boards, CPU's, Eclipse, Embedded, Embedded Components, FatFs, FreeRTOS, Freescale, KDS, Kinetis, KL25Z Freedom Board, NXP, Processor Expert, Shell and tagged Adafruit, Breakout Board, Eclipse, Embedded Component, FatFs, FRDM-KE02Z, freedom board, FreeRTOS, Freescale, gnu gcc, microSD card, open source projects, Processor Expert, SD card, software project, technology, Tips&Tricks by Erich Styger. Bookmark the permalink. static portTASK_FUNCTION(Task1, pvParameters) –> after LEDR_Neg(); –> this works, file gets created. So where is the first place I am able to program SD Card Access? Thanks in advance for your help! glad to hear you like this site :-). that’s it. Thank you very much! I didn’t realize that checking the SD Card would automatically mount the drive. But I could have thought that by myself, because where else if not there the mounting is done. Thank you for this fast help. It will be most likely that i might show up with further questions about other posts and topics 😉 the provided examples by NXP/Freescale do not cover much for a noob like me. Where can I get further information about programming Kinetis with Kinetis Design Studio? Is there a book/some books you could recommend? I admit that I’m probably too long in this domain and might things are granted. So thanks for your questions, that way others can learn from comments and discussions too (I have learned from such discussions a lot!). I have a books section on https://mcuoneclipse.com/books/ but I have to say that I’m not aware of a book which would cover exactly what you need. It seems that these days only few are buying books, and writing books is a loog of work (and financial risk), and after a year the book is already outdated. The lack of good tutorials or material is exactly the reason why I’m putting up things here: because for all the things I write about, I have not found adequate information in books or on the web. You might google for ‘mcuoneclipse’ and the keywords your are looking for, and you might hopefully find something useful. If not, post a question under https://mcuoneclipse.com/qa/ and I try to help out. hey, i’m trying to read data from the MPU9250 to the KL25Z but i’m so lost on how to establish the I2C communication between them, so if anyone has an example or has done this before, i’d apreciate any help. Thanks! 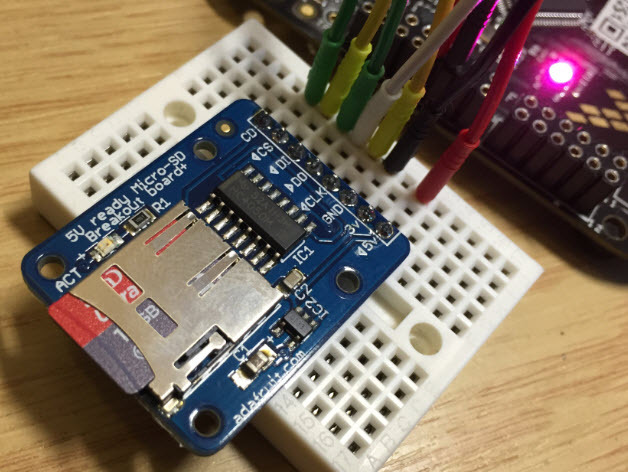 To pratice using Processor Expert I tried to create the Adafruit SD Card project by myself from scratch. 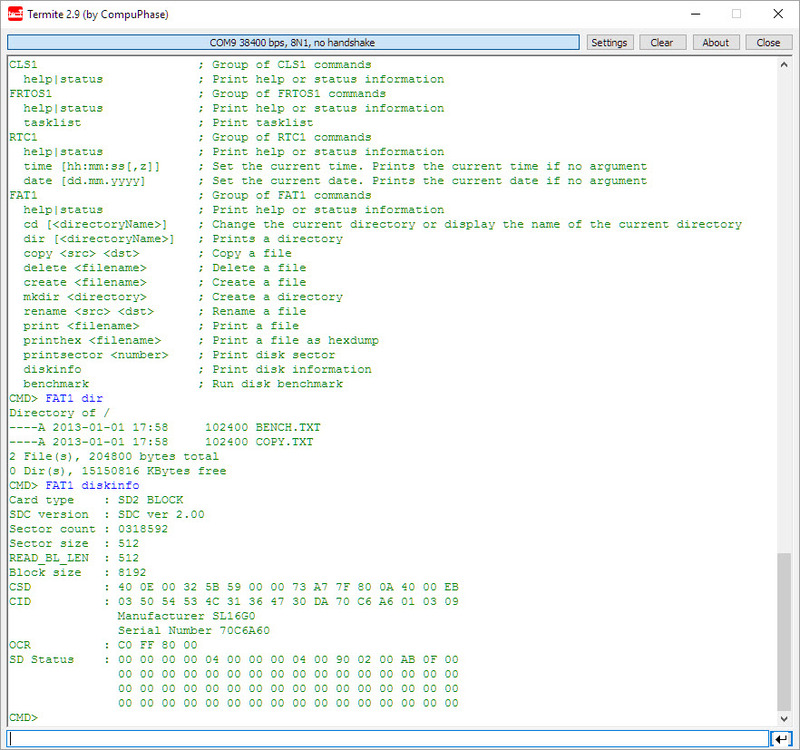 At first I added the FAT_FileSystem component. But some of the required components (i.e. SD_Card) need other components (i.e. SPIMaster_LDD), that supposedly are not supported by the selected processor, at least the IDE tells me that and marks those components with an error-marker. I don’t understand how that can be, because I selected the correct board and the processor is the same as in your project. But if I select the processor component in my project and the one in yout project, there are different settings. Are there different ways to create a Processor Expert project? I guess you selected the SDK V1.x or V2.x option during project creation? Do not use that (create a Processor Expert only project). Then I am able to choose, which SDK Version I want to use. I tried “none”, but then the Processor Expert file is completely empty. No Flash and no Processor Component is added. Is that the right way? If I do choose a SDK Version, then some components can not be added because of incompatibility with the processor. File > New > Processor Expert Project > give project name > select device (KL25Z128) > select ‘none’ for SDK and turn on Processor Expert. Aaaah. I always selected the board instead of the device itself. It seems that selecting a board without the SDK the processor expert project remains empty. But what do I need the SDK for then? I read your post “Overview: Processor Expert”, but I still don’t fully understand how SDK and Processor Expert interact with each other. Maybe I’ll get those informations from the book. Because I guess the answer to this question is quite complex and therefore something I should figure out myself 😉 thanks for your quick response! that thing with the board selection I think is a (known, at least to me) bug. thanks again very much. I think I have an idea of how both parts work. I had a course “Microcontroller and Microprocessor Technology” at the University of Applied Sciences where I study right now and we used a training system based on ATXmega128. There were many prepared examples/source files for using SPI, OLED and so on. I already had the feeling that using microcontrollers must be like finding a way through a thick jungle, because documentation and examples are very rare. And now I am facing it. The more glad I am that you put up this platform. With this, the application won’t continue after f_lseek. If I pause execution, the current executed line is in function SD1_SPI_WRITE_READ. If I look at the card in windows explorer, the file is empty, but the used disk space shows some 300 Megabyte. From ff.c I concluded that fp.fsize must be the maximum offset from the top of the file and therefore getting me to the end of the file. What am I missing or doing wrong? 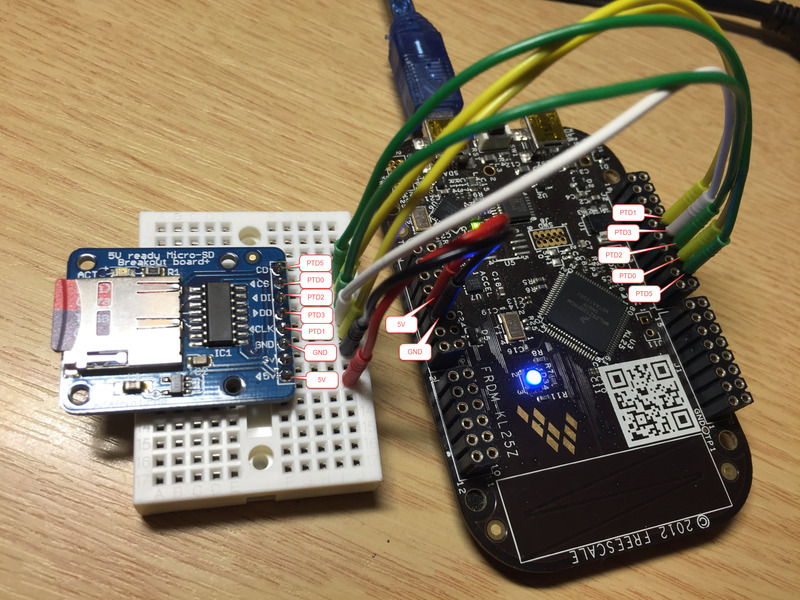 A little offtopic: when I connect SD Card and GPS Sensor to the board power pins (SD Card @ P3V3 and GPS @ P5VUSB) the LED of the breakout board sometimes went off. I couldn’t find any specification in the FRDM-Board data sheet regarding maximum supply current on these pins, but the fact that it works without connected GPS-Sensor seems to point to a current overload. And yes, f_size() (or fp.fsize) is the size of the file, so should move your file pointer to the end of the file. Do you have an idea why it is stuck at SD1_SPI_WRITE_READ()? Sounds like either your SPI is not working (wrong pins?) or your interrupts are not turned on? About the current consumption: you definitely have to power your GPS board with a dedicated power source. Keep in mind that SD cards can use several hundreds of milliamps too. The regulator on the FRDM board: you need to check the data sheet/schematics (as there are different ones on different boards), but as a rule of thumb you should not consume more than 100-200mA. thanks for your answer. I am not quite sure why this happend. I tried it again and paused the program. Then it halted in an ISR of the SPI-Interface. It seems to me that somehow the seek was not successful and it tried to do it forever. I unfortunately did not set a break point inside f_lseek. GPS was not powered on, so it should have nothing to do with power issues. All at once it works now. I changed that I opened and closed the file after every data write. I did it as in your Adafruit GPS logging example and now seeking in the file works fine. Even with GPS Sensor (Adafruit GPS Ultimate Breakout, without SD-card) attached to P5V_USB. This is a bit strange. Maybe one of the wires to the board is kind of crappy. What I am not sure about: if I do not close the file, changes are not written (at least not emmediately) to the card. Due to limited RAM, when does FatFs write data to the sd card? Or do I have take account for myself that after i.e. 512 bytes of data (for 512bytes is typical block size) I close the file and reopen it to avoid RAM or buffer overflow? do you have now a better/stable power supply for your sensors: if it cuts down the voltage, strange things can happen. As for when data is stored: FatFS uses by default an internal buffer of 512 bytes per file. So if you start writing byte by byte, the data kept in RAM until it goes beyond that block buffer. At the time writing to file offset 512, it will flush/safe the bytes 0…511, and so on. Data is flushed/stored as well when you close the file. So closing the file is ‘expensive’, as it will write that buffer to the file, even if only one byte changed. Plus you have to re-open the file. That’s fine if you are not concerned about performance, have small amount of data or there is a long time where you do not write data. Instead closing the file, you should do f_sync(): this will flush the data to the flash, without the need to close and reopen the file. Thank you very much for this amazing website! It is a great help for all of us developing with Kinetis. I am working in a data-logging system based on the KE06Z and I am trying to adapt your code for the KL25Z to the my device. Everything (GPIOs, operating system, serial interface, …) is working properly except for the SPI. I have selected the right pins in the KE06Z but in KDS 3.2.0, in the Referenced Component SM2:SynchroMaster[HWSPI] I get the following error for method SetBaudRateMode (which can not be generated): “Method is required by the interface, but is disabled by component settings or by template”. Could you give me any hint on how to generate the code for this method? in the shift clock speed setting for the SPI, select ‘list of values’ instead of ‘fixed value’ for the runtime settings type. in the meantime I experimented a lot with data logging with this adafruit breakout board. I already implemented sending the files to my PC through USB UART. Because the log files are rather big (about 3MB per file) and the SD card is located in a water tight enclosure, it would be nice to have a fast way to download the log files preferably fast without the need to open the enclosure. To determine, how fast I am able to send the files to my PC, I ran the benchmark provided by your FatFs-Project example. I was a bit suprised that read speed was only about 125kB/s. Did you perchance run some benchmarks and if so, what read speeds were you able to get? May I incidentally have chosen an improper micro SD card? Somewhere I read that somebody got slow access speed with a super fast micro sd card used in action cams and got higher speeds (siginificantly more that 1MB/s) with an ordinary card. I am using a Transcend 2GB micro SD card, nothing fancy like HC or XD. The other constraint is the baud rate of the USB UART connection. The highest value that is listed in the blue italic font that I think are recommend values is 256000 baud which means 32kByte/s. Then there are the values in black font that range up to 120 000 000 baud. In Tera Term, the fastest possible setting for openSDA port is 921600, which means 115,2kByte/s. Is this the fastest connection that I can establish to my PC to download things from the SD-Card without taking it out of the break out board? Did you use such high baud rates to communicate to a PC? What other options do I have to make a fast connection to my PC, at best without having to develop my own drivers? Is the USB CDC maybe a way to go? 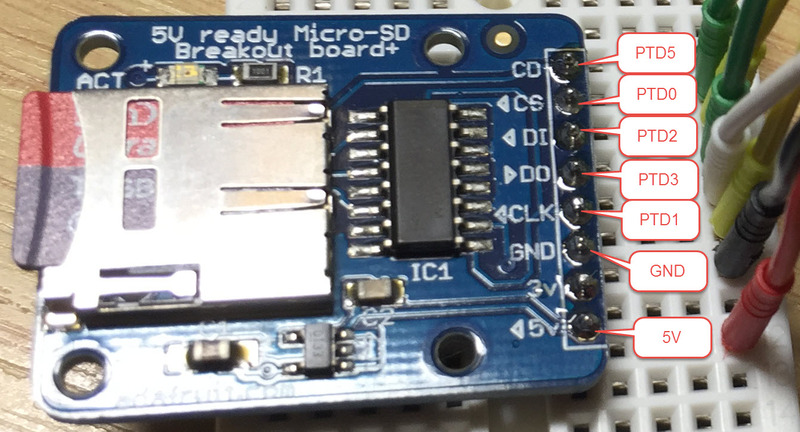 As I understood the USB CDC tutorial, it enables UART to PC without having to use the K20 chip on the freedom board, meaning that connection speed lower than 115,2kByte/s also apply for this possibility. If I remember correctly then I was able to reach read speed around 300 kByte/s, and write speed was around 125KB/s. Using the the SynchroSerial (SPI) component the speed was even lower, best result I had with LDD_SPI variant. About speed reached with cameras: they usually have special optimized access routines and additional caching to my knowledge. You could improve the read/write performance probably up to around 400-600 kByte if using DMA. I was too lacy to get this implemented as my applications are OK with a read/write speed around 100 kByte/s. As for the serial/UART port: the highest baud I ever used in a project was 1843200 between the microcontroller and a sensor. I have not used anything higher than 115200 with a host PC (most UART do not support higher baud). Keep in mind that the higher the speed, the more accurate your clock has to be, otherwise you will have to many errors. USB CDC won’t give you much more data bandwidth because of all the USB overhead. And for the higher UART baud rates: I think you will use interrupts, right? That means you will get a lot of interrupts and this again will slow down your system. You might consider to stream off data with a parallel or SPI interface. How could adapt the FatFS component to be used on a RAM-based USB MSD? I mean, I would like to use the processor’s internal memory as a USB MSD where I can create files with values I get from sensors. you would have to replace the low level disk I/O driver with routines to access the RAM instead using the flash memory. Plus you need to make a volume every time you boot, as you have lost the RAM. i am totally new in SD card and KL25z, so FIrst tell me from where i start to interfacing SD card with KL25Z. I am using KDS IDE of kinetis. You need the extra McuOnEclipse components, available from SourceForge (https://mcuoneclipse.com/2014/10/21/mcuoneclipse-releases-on-sourceforge/). Then I recommend you start with the example project on GitHub. Plus you need to make sure that you are using a good breakout board like the Adafruit one. In any case: use a logic analyzer (highly recommended), plus have a read at the FatFS site (http://elm-chan.org/fsw/ff/00index_e.html). Your posts are wonderful. You explain very well and I feel happy to learn more and more. Thank you for such a wonderful article! Could you tell me where I can buy such a headers (2×6, 2×8, 2×10) for FRDM-LK25Z as in the photos? Many thanks! I found on AliExpress similar headers as in the photos ( https://aliexpress.com/item/Wholesale-free-shipping-2×40-Pin-2-54-Female-Pin-Header-Round-hole-high-quality-low-price/32393543308.html ).